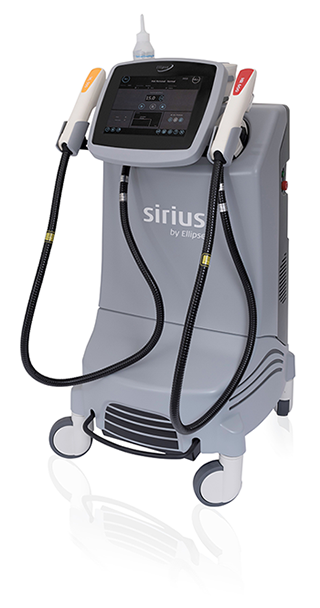 Sirius by Ellipse is a high-tech system for treating unwanted hair. The treatment effects are achieved using special light which is emitted directly on to the skin by way of an applicator. Selected Waveband Technology: safety that creates trust! Ellipse has a filtering technology that uses unique SWT (Selected Waveband Technology) applicators to filter out all unnecessary and potentially harmful wavelengths of light for each type of indication. The Ellipse Sirius therefore only uses the wavelengths required for the respective treatment and not the light components absorbed by the water in the skin. Thanks to precise filtering provided by Ellipse’s copyright-protected Selected Waveband Technology, optimal treatment results are made possible using significantly less energy. In comparison to most other hair removal systems, there is no need to cool the skin with Ellipse. This unique filter technology provides safe, skin-friendly, and virtually pain-free treatments that are extremely effective all over the body. Sirius is one of the most proven and well-known hair removal systems in the world thanks to the large footprint and first-class ergonomics of SWT applicators. Proven to be kind to the skin, effective, and safe! The effectiveness and skin compatibility of the treatments have been repeatedly tested and proven in international clinical trials. With the Ellipse Sirius, Hairless Skin offers a method that meets the highest safety requirements. Ellipse Sirius is certified as a medical device according to the strict regulations of the ECC Medical Device Directive.